Working full time, school full time and three choirs (three, you heard me) turns out has seriously cut into my crafting time. Major downside. But, for now, that’s my life and I like it. I will still be working on stuff and posting it as often as possible, but the frequency will be much lower. While away for vacation, I of course took along projects to work on. I took a knitting project, which actually didn’t end up getting worked on, an embroidery project, and a sewing project. 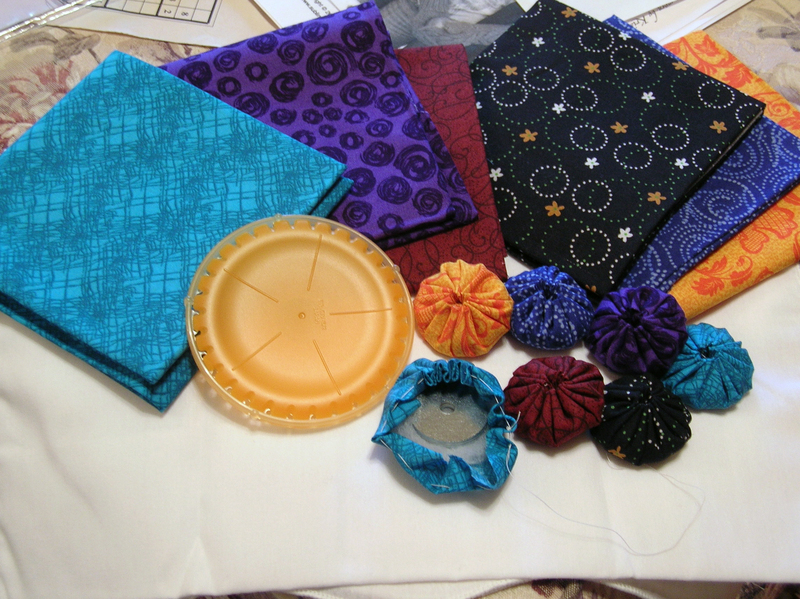 The sewing project was small hand-sewn yo-yos that were weighted, for use as pattern weights. I was inspired by this post on a blog I read, A Spoonful of Sugar. For our anniversary, my N and I decided to rent a little cabin about 4 hours away from home and hang out there doing as little as possible. It was so wonderful. We were enough in the middle of nowhere that wen didn’t even have cell service. Bliss! I’d taken along some portable projects to work on while we were there, because, really, how can you truly relax if your not crafting something? 😉 There was also a little creek not to far from our cabin that we walked down to one day. So pretty! After a few days there, we went back into the “real world” (if I dare call it that) and met with a dear friend from college for lunch and my old roommate from college for dinner. I knew I’d be glad to see old friends, but I didn’t know how good. There’s something truly special about not seeing someone for a long time and being able to step back into that friendship over dinner. I wanted to post some of the pictures of the creek and cabin and the trip in general. My next few posts will be about the fun crafts I worked on. These were such small flowers! If you were to judge my activity by this blog, you’d think I didn’t have much going on. However, the more I have going on in the real world, the less tends to do on in the blog world. I’ve been so swamped! It’s a good thing, but it’s still a swamped thing. So, I’m going to do a series of posts over the next few days that fill in the gaps of the last couple (or three) weeks. As well as filling the little bit of crafty things I’ve managed to get done as well. I hope you enjoy the window into my little corner of the world!